Fax: +65 6256-0501 for viewing or updates. Complete the ON-LINE house hunting enquiry and your personal agent will contact you within the next 24 hours. Alternatively, download the house-hunting form. Fill in the form and fax to 6256-0501 or e-mail judy@asiahomes.com. S$30.00/40 words/90 days. Add S$15.00/picture 600X600 pixels. 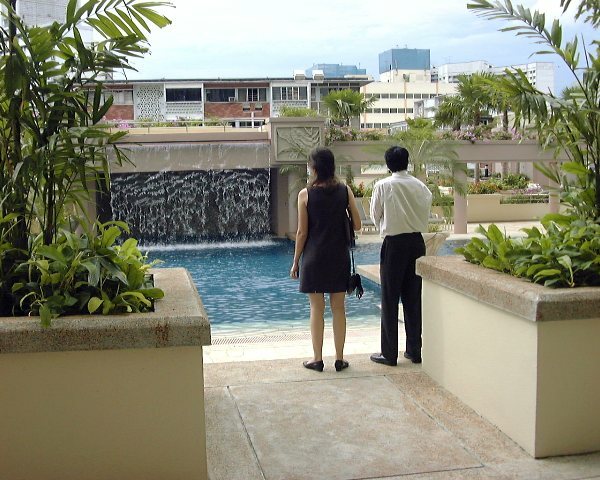 E-mail your advert/query to judy@asiahomes.com or tel: +65 9668-6468. 3 blocks converging to form an "L"-shaped layout. Residential units start from the 5th - 20th storey. Sizes from 667 to 3,003 sq. ft.
1 bedroom: 753sf (A1b), 743sf (A2p), 1270sf (A1p), 732sf(A1), 667sf or 689sf (A2), 753sf (A3). Rent from $2,500. 2 bedroom: 1302sf (B1p), 1152sf (B2p), 936sf (B1), 840sf (B2), 829sf or 861sf (B3), 872sf, 883sf or 915 sq. ft (B4). Rent from $3,000. 1690sf or 2013sf (C4). Rent from $4,000. Bigger 3-bedroom may have an extra store room between the living area and bedrooms, very important for expats who are a couple. Singles may not need so much space. 4 bedroom: 3003sf (D1), 2164sf (D2), 2939sf (D3). Rent from $6,000 - $9,000. 5th storey: A1p, A2p, B1p, B2p, C1p, C2p. 6th storey: A1, A2, B1, B2, B4, C1, C2. 7th-16th storey: A1, A2, B1, B2, B3, B4, C1, C2. 17th-18th storey: A2, A3, B1, B2, B3, B4, C1, C2. 19th storey: A2, A3, B3, B4, C1, C2, C3. 20th storey: A1b, A2, C4, D1, D2, D3. #20-01 (C4), 20-05 (D2), 20-09 (C4), 20-10 (D1) and 20-06 (D3). One description of a Penthouse, Tower A,#20-10 (Type D1) has 4 bedrooms, 3003sf, but there is a very big private terrace which is accessed by Bedroom 4 (attached bath). This can be used as a guest room or a SOHO (small office home office). The big terrace is large and almost the same size as the combined areas of the master bedroom and Bedroom 2 & 3. These 3 bedrooms are separated from the Bedroom 4 by a living and dining area, permitting privacy for sleeping if Bedroom 4 has fax machines when used as a SOHO. However, the bedrooms are small although the master bedroom can accommodate a king-sized bed. The living and dining areas are relatively small if you have a big dining table for 8 and a couch for 6. There is access to a private roof garden upstairs. 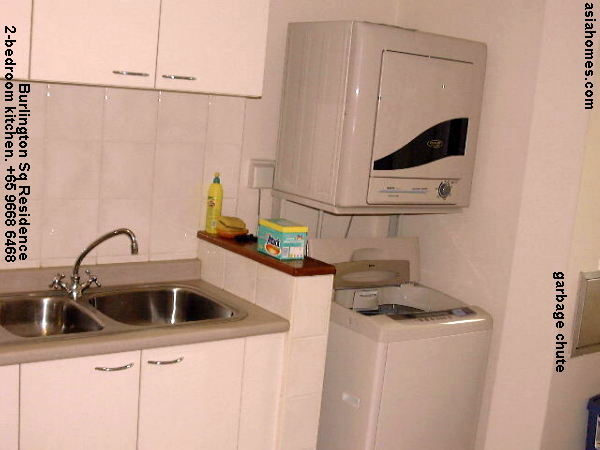 This unit suits expats who have no children and entertain a lot. The living/dining area is really too small for a big dining table with 8-10 chairs. There are dual basins in the bathroom of the master bedroom. A beautifully landscaped swimming pool with cascading waterfall (see image below, click thumbnail to view impressive pool) to impress your clients or friends is on the 5th storey. A wading pool for kids. 2 Jacuzzis on the right side. BBQ pits and pool deck to host parties. The tennis court is beside the pool in the background and the gym is on the left. Changing room has steam baths. A multiple-purpose hall to host birthday parties or company functions. Gazebo or barbecue corner. Covered car park and security on 5th floor entrance. Mixed Development: Burlington Square comprises a four-storey retail podium, a 12 storey office block with 90 units, and three 20 storey residential towers (called Burlington Residence). All are strata-titled and temporary occupation permit was obtained in December 1998. Investors to note: The 99-year residential units, ranging from 667 sq. ft to 3,003 sq. ft each are for sale. 24-hour security guard station at main lobby & residence lobby. Closed-circuit TVs fitted at strategic locations. Audio intercom system in apartment. Panic buttons in master bedrooms. Car park entry regulated by card access. Card access needed to get into the apartment. Maid service on request for the 2-bedroom apartments. In-house support and maintenance service team. Occupancy Rate: It seems that single expats and those without children just love this residence as they have food and beverage joints downstairs and are within a short taxi ride to the Suntec City or Raffles Place. For rental viewings, contact judy@asiahomes.com for a good deal. 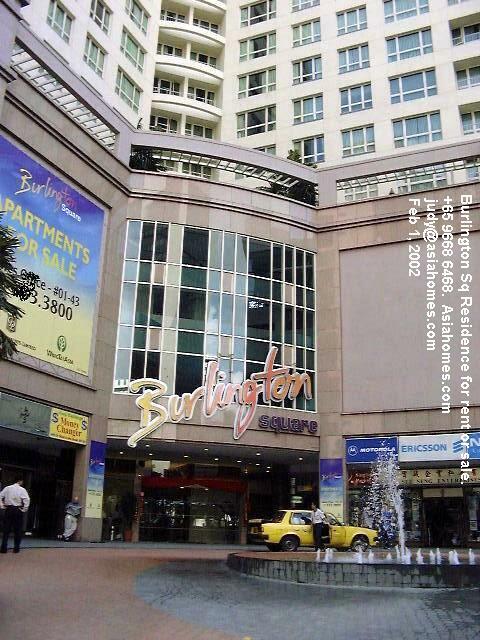 Competitors: Not many, but there is The Bencoolen Residence and Sunshine Plaza nearby. Expats with children will prefer a residential development like Aspen Heights instead of a mixed one with retail shops below will not be the type of clientele to bring to see this place. Investors: The Government intends to develop this area into an entertainment area equivalent to those in Hong Kong, London or New York. This development is close to the new University being developed at the National Library area. Investment in the shops or offices may be attractive, depending on the type of trade. Mixed development residences in general do not have as good resale value or rentable characteristics as pure residential developments. Great location in the heart of downtown. 5-minute walk to Orchard Road. A 10-minute walk to the Bugis or Dhoby Ghaut subway. Younger expats don't mind walking to the Suntec City (City Hall subway) in around 20 minutes. The new Kandang Kerbau subway may be ready in later years. The pool and gym on the fifth floor have a resort ambience. In-house management and security available. Double-glazed 12-mm glass windows effectively cutting off road traffic noise. Units facing the pool have no noise. Many buses and taxis to Raffles Place, Suntec City, Orchard Road in 5 minutes. No need to walk to the subway. Many eateries and cafes in the neighbourhood saving time for busy expats. Orchard Road malls, Plaza Singapura, Suntec City, Marina Square, Raffles City, Bugis Junction, Parco, Chimes are within a 20-min walk. The civic district of Fort Canning, Singapore Art Museum, the Waterloo Street Arts Belt, Young Musicians' Society, Sculpture Square, The National Museum and National Library and Fort Canning Park are not too far away. Lack of land and garden. Most expat with families prefer purely residential developments with a real garden. This development has attracted single expats or those without children and who work near Raffles Place/Suntec City and want to wake up late. Around a 5- to 10-minute walking distance to the Bugis subway may be too much in the humid weather of Singapore but there are so many buses and taxis. City living crowds and noises to be expected. ERP (Electronic road pricing) charges need to be paid every time one leaves the restricted zone in which this development is sited. This ERP effectively controls traffic jams in downtown but is a financial cost to tenants who drives. Charges range from $1.00 per entry into the restricted zone and may deter cost-conscious expats and expats on local employment terms. No balconies. 5th floor units may have a patio while penthouses on the 19th and 20th floor have private terraces and/or roof terraces. These are snapped up immediately as Caucasian expats seem to love balconies. Email judy@asiahomes.com or tel +65 9668 6468 for more information and to view. Living/dining - polished marble. Bedrooms - teak parquet flooring, built-in wardrobes for master bedroom only. Cable connections in all rooms. Kitchen: Ceramic wall and floor tiles. Cabinets. ELBA TURBO oven, cooker hood and hob. Built-in sink. White kitchen cabinets. The master bathroom has marble tiles, 1 long bath and shower stall. The common bathroom is shared by the other 2 bedrooms but are separately located. There may be 2 attached bathrooms in the 4-bedroom units. Case studies for www.asiahomes.com realtors. 1. Realtor, qualifying properties well to save on advertisement expenses. "We took down your "FOR RENT" notice because we are worried about the apartment being burglarised," said the Owner's Representative who had earlier complained that the "other" realtor was not performing. This Gallop Gables Condo was facing a half-completed Condo (2nd phase of Gallop Gables with construction up to 2nd storey suspended for the last 6 months). The Asia USA Realtor had spent a lot of money and time on this promotion with one or 2 responses. When prospects see the half-constructed Condo, they lose interest in further discussion although the interior quality is of higher than usual standards. As we were given the keys, we gave attention to the promotion of this condo. However, the Owner's Representative uses it as a "holiday retreat". The Landlord wanted a rent of around $3000. An offer of $2,000 was rejected as the Owner felt that the cost of damage to this condo will be too great. She would rather pay the $8,000/month mortgage. Ironically, the Gallop Gables management did not object to the sign, placed discreetly on the sliding door and bedrooms. Although there is no guarantee, a "FOR RENT" sign for low floor rental properties do let agents/neighbouring tenants know that the property is available for lease and there have been cases of success. Obviously, the more disadvantaged the property has, the more important it is to expose its availability for rent. The risk of burglary is not very high in a condo with security like closed-circuit TVs and guards as in Gallop Gables. In any case, burglars can recee and know which unit is vacant. It is a heavy responsibility to accept the keys of the Owner's properties but you have to cut losses if you have no responses in your advertisement and promotion. There are so many "rentable" units - it is foolhardy for novices to spend time on units with unfavourable characteristics. You don't earn income but your Straits Times advertisements will wipe out any profits from other sources! Reducing expenses is one way of being profitable as the net profit is gross income minus expenses. You do need every penny when you just start up your business. Qualify properties well to save on advertisement expenses. Don't flog a dead horse to prospective tenants when there are too many residential units available for rent! "Take this last unit, somebody wants it now". An Australian lady told me that a Singapore realtor brought her to see $9,000 condos, including one with a pool in the living area, although she said her budget was $4,000. He even called her home in Australia to find out when she would be arriving in Singapore. He also showed her some houses with unsuitable furniture in a "far away" place like Chestnut when she wanted to live nearer to Raffles Place. He used "if you don't take this unit, somebody is going to take it today. Decide now" hard sell strategy. Little did he realise that she studied mass communications in the Curtin University and had worked over 4 yours in the pure advertising agencies. She knows more than you and me when it comes to sales advertisement techniques. You are trying to tell her that there are no more units when she has had surfed the internet and knows that there are so many choices of rental condos and houses! Up to now, I can't comprehend why a rental realtor, if he is self-employed, would show units double her budget, leading her to comment that the realtor thinks that "Caucasian expats are stupid". All expats who make it to Singapore to work are very well informed. Therefore, don't pull the "last unit left, if you don't take it, someone is just waiting now!" strategy. You may have to read up more about "hard sales" and show what the expats want, rather than wasting your time and time is money for a self-employed. She called another realtor as this one who had spent a lot of time showing her apartments, was just NOT listening to what she wanted. 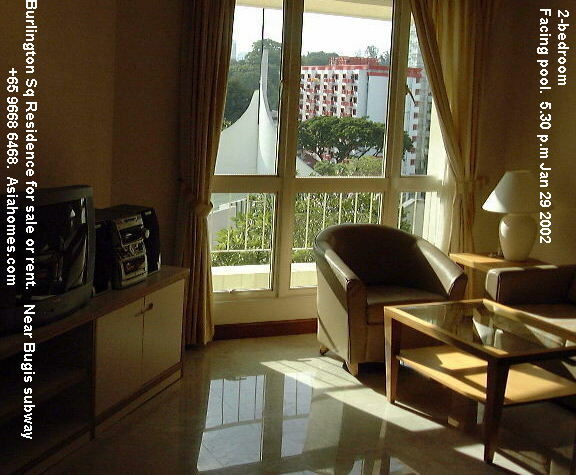 E-mail your advert/query to judy@asiahomes.com or tel: +65 9668-6468. 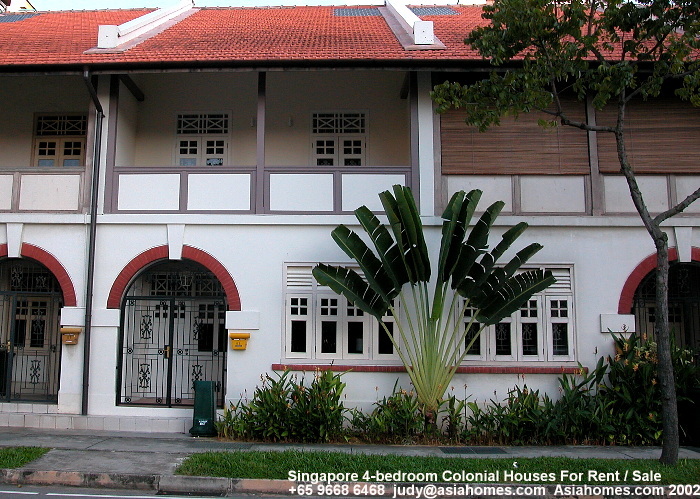 S$4,500 - $5,800 for Townerville colonial houses for rent. No condo facilities. Focus: Myanmar travels and tours and international student tourism.